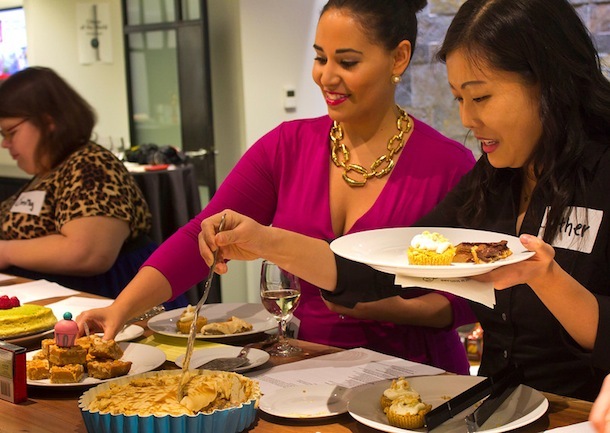 Last fall, I was invited by the folks at Walker's to participate in a blogger bake-off. Walker's is, of course, the amazing Scottish shortbread company with the bright red tartan boxes. You know them. They're everywhere! 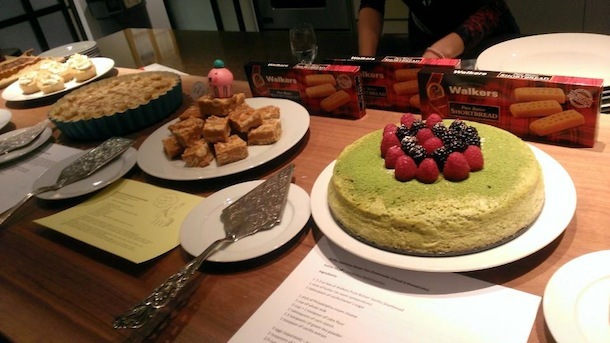 The challenge was to use one of the varieties of Walker's shortbread to create a unique dessert recipe that a panel of judges would then taste to declare a winner. I'm always up for a challenge, and so I accepted, soon receiving a box filled with about 20 boxes of shortbread (!!!) for recipe development purposes. The competition was supposed to take place in early November, but then... Sandy happened. As the hurricane raged on and half of New York City was essentially turned off for several days, the challenge was postponed. I ended up donating the majority of those boxes of shortbread to a Sandy food drive and waited to hear back about the challenge. We finally heard that the challenge had been rescheduled for mid-February and more boxes of shortbread were sent our way. It was finally time to figure out my recipe! Since I'm obsessed with almond recipes (obsessed!) I decided to use the almond shortbread cookies to create a buttery, salty almond-flavored tart crust. Once I had that part done, I needed to figure out what to put inside (if you remember my Braised Pork Mofongo Tart, you'll see that this is generally how I approach my tart making). I think pear and almond are brilliant together, so I sliced up some pears and layered them into the crust. And to tie it all together? No, no...wait! A CHOCOLATE custard. With hints of almond, naturally. Once I pulled the first test tart out of the oven, I knew I had a winner. It smelled absolutely incredible and looked gorgeous. I snapped a quick photo to post on Twitter. 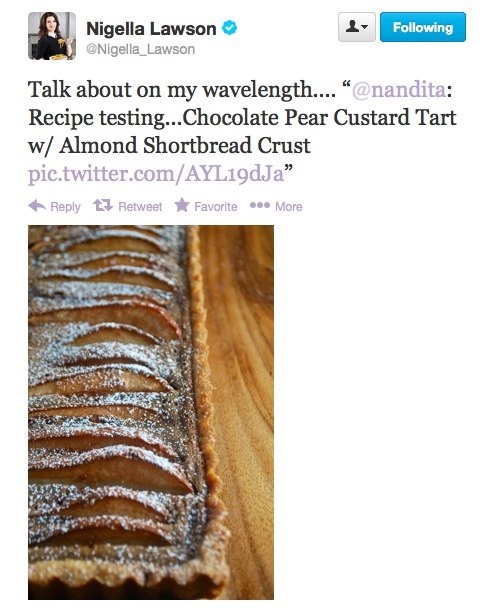 And then Nigella Lawson (who follows me on Twitter; a mind-boggling fact on its own) happened to see my photo and commented that my tart was on her "wavelength." So I figured I was definitely onto something good. 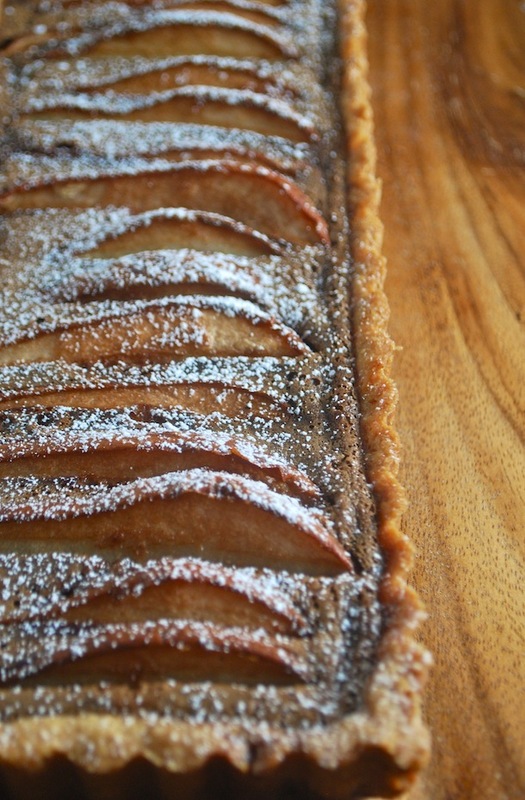 My pear tart recipe ended up winning 2nd place in the competition--not bad at all! And I got to spend an afternoon sipping wine and eating cured meat with some of the other amazing competitors, including Esther from Ambitious Deliciousness--who made a gorgeous Fluffy Green Tea Cheesecake--and Emily Hanhan from Nomnivorous--who made a luscious boozy banana cream pie (they tied for 3rd!). I was also excited to see Jessie Oleson from Cakespy (who made these crack-like butterscotch cashew bars that I can't stop dreaming about). 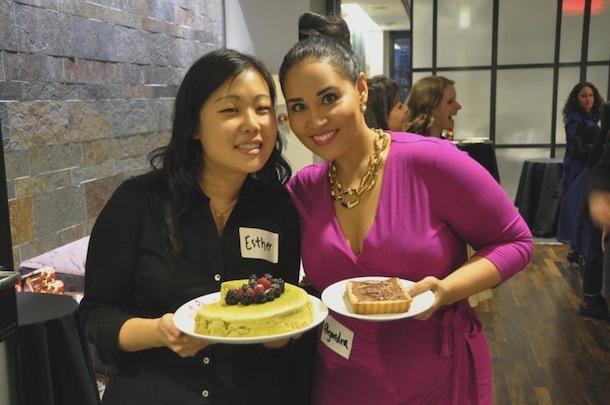 The winner was Kayle Blogna from The Cooking Actress with her Vanilla Honey Shortbread Pie. 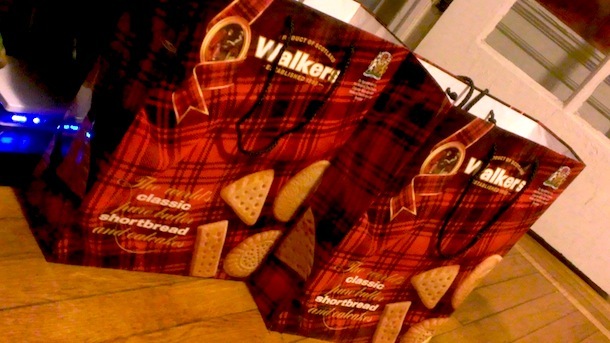 All the competitors were sent home from the event with two giant tartan bags filled with shortbread and other goodies. I actually had been invited by a friend on Nigella's publicity team to attend a talk she and Mario Batali were giving in Union Square after the event (talk about full circle! ), and so I showed up there with my not-at-all subtle tartan bags filled with cookies. As I took my seat, an English woman sitting next to me excitedly asked "Oh! Are they handing out biscuits for everyone?" "Um...no," I replied, pulling my bags a bit closer. "These are just my personal biscuits." The pears below are simply tossed with a bit of sugar, but if you'd like to up the flavor, feel free to gently poach the pear slices before layering into the tart crust. Here is a great basic poached pear recipe. First prepare the crust. Preheat oven to 350 degrees. Place shortbread cookies in food processor and process until finely ground. Add the egg, melted butter, flour, sugar, salt, and extract, and process again until a soft, buttery dough forms. Remove dough and roll into a ball. Wrap in plastic and chill in refrigerator for 20 minutes. Press the chilled dough into 13” x 4” rectangular or 9” round tart pan and score all over with a fork. Place tart pan on a cookie sheet and blind bake in the oven for 7 minutes. Remove and let cool. Toss the pear slices in a bowl with the cinnamon, sugar, and lemon juice. Set aside. Combine the butter and chocolate in a small saucepan over low heat, stirring until completely melted. Stir in the milk, almond, and salt. Set aside. Combine the egg, egg yolk, sugar, flour, and cocoa powder in the food processor or mixer bowl and process for 2 minutes. Pour in the milk and chocolate mixture and continue to process until smooth and completely incorporated. Arrange the pears in the tart pan, peel side up, and then pour mixture so that it reaches the very top of the crust (depending on the size of your pears, you may have some custard leftover). Bake for 25 minutes at 350 degrees, or until filling is set and crust is slightly golden. Let cool completely before serving. Disclaimer: Walker's provided complimentary product samples for recipe development purposes. 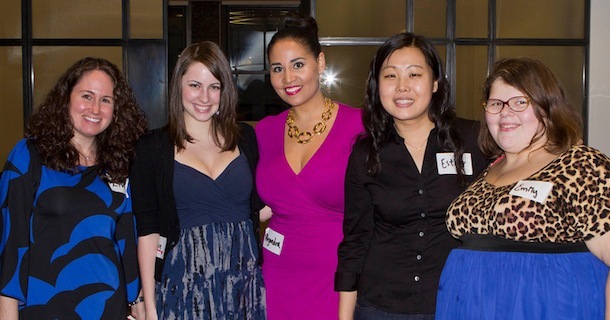 I was not otherwise compensated for this post or my participation in this event. Nigella Lawson is in no way affiliated with Walker's or this blog. All opinions and recipes are my own.